To make the pizza base, place the yeast, sugar and water in a small bowl and mix to combine. Set aside in a warm place for 5 minutes or until bubbles appear on the surface. Place the flour and salt in a large bowl and make a well in the centre. Add the yeast mixture and oil and, using well-floured hands, mix together to form a dough. Knead the dough on a lightly floured surface for 4–5 minutes or until smooth and elastic. Place the dough in a large, lightly greased bowl and cover with a clean, damp cloth. Set aside in a warm place for 30 minutes to rest. Preheat oven to 200°C (400°F). Divide the dough in half. Roll out each half on a lightly floured surface to form a 35cm x 25cm oval. Place each base on a lightly greased large oven tray lined with non-stick baking paper. Place the broccoli, oil, lemon rind and garlic in a bowl and toss to combine. 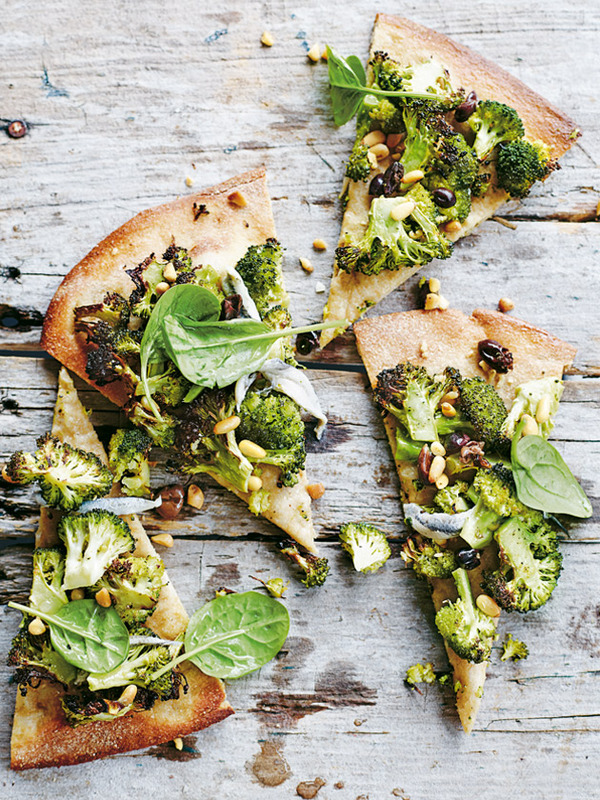 Divide the broccoli mixture between the pizzas and cook for 15 minutes or until the bases are cooked through. Top with the anchovy, spinach, olives and pine nuts. Serve with lemon wedges, if using. Makes 2. + Made by grinding the entire grain of wheat, whole-wheat flour is less refined than white flour, leaving the most nutrient-rich parts of the grain intact. It’s available from health food stores.